Fascinated by the endless abundance of aesthetics and challenges, the focus of Daniel’s work lies in the field of contemporary music. This led him, with his ensmeble, hand werk, for instance, to several concerts in major festivals such as Acht Brücken – Musik für Köln and the Wittener Tagen für Neue Kammermusik. His concerts are frequently broadcast by renowned radio stations such as Deutschlandfunk and the WDR. Furthermore, he tours his solo programmes and collaborates regularly with composers, video artists, dancers and poets. 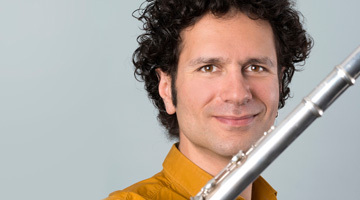 In his flute quartet, Verquer, he crosses boundaries beyond his classical music education, playing latin, jazz and pop. His duo with pianist Jamina Gerl, Trio Contrejour and his frequent collaboration with orchestras like Sinfonietta Köln and Folkwang Kammerorchester are dedicated to the classical repertoire. Daniel Agi was born in 1979 in Mashta-Azaar, Syria. He studied flute in the conservatories of Cologne and Freiburg with Hans Martin Mueller and Prof. Robert Aitken. In 2004/2005 he played in the Duisburg opera orchestra (Deutsche Oper am Rhein). In 2006/2007, he was member of the International Ensemble Modern Academy, where he received his master’s degree in the performing of contemporary music. Frequent tours have led him to Korea, Ecuador, the USA and Kuwait, among other countries.